I know a few freelancers that have gone back to being an employee because they felt too isolated. I get it – having co-workers is the one thing I miss about being an employee. It’s such an easy, unforced way to get the daily social interaction that humans need. Want to know how my weekend went? Anyone? I make reasons to leave the house – In the age of the Internet, you pretty much never need to leave home if you don’t want to. You can order anything you need online, stream your entertainment, find exercise videos on YouTube and use social media to keep up with your friends. But as a freelancer, I don’t need any more reasons to stay home. I love to walk, so I buy whatever I can at shops near me. I also ensure that I get out to socialize, exercise, go to movies or cultural events, take courses and meet clients for lunch. I intentionally stay in the analog world as much as possible, because it helps me get the social interaction I need. 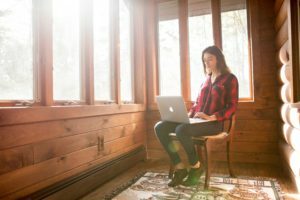 I leverage the resources that are cropping up with the gig economy – Co-working spaces are everywhere these days, and they can be a much-needed change from my couch. Being around other people that are working hard is also good for my productivity – I find that it encourages me to take fewer breaks. I make sure to connect with someone at least once per day – It’s not enough to just get out of the house, you also need to connect with other humans. Face-to-face is ideal, but digital connections can work too. Think about the most important people in your life – do you know what’s going on with them right now, what they’re thinking about or planning? If you’re not sure, it’s time to get together. I look presentable when I work – Working in your pajamas seems decadent, but the longer you stay in your “I just rolled out of bed” look, the less motivated you will be to ever leave your house. When I work from home, I typically look like I do when I’m out on the weekend – casual and comfortable, but still ready to meet the world. That way, as soon as my laptop shuts, I can put on my shoes and head out the door. I get out at lunch – Most of us take a lunch break, and it’s the perfect time for a 15-minute walk around the neighbourhood. I do this most days, and I find getting out of the house mid-day helps motivate me to go out again later. I take advantage of my free hours – Four years ago, if it looked like I had a light week ahead, I’d take Monday to relax, thinking I’d go have adventures later. Guess what would happen next? The phone would ring at 4:30pm and I’d be working hard the rest of the week, cursing myself for not taking better advantage of my free time. Now if I have a few free hours, I am out the door. I get involved – I’ve volunteered at a few events recently, and it makes me feel much more connected with the outside world. I plan to do this more regularly this year. You need to be pro-active if you want to work from home and avoid feeling isolated. If you have any other strategies that I haven’t mentioned, please leave a comment below. I’m always up for new ideas on how to stay connected in the sometimes isolating freelance world.